After dinner, we got dessert during Tango’s break! We had dinner early, when there was hardly a crowd at the Tech Carnival which was just outside the stadium. So when we went back out, it was very crowded! Luckily, the line wasn’t too bad for dessert! As the name says, Frozen Kuhsterd sells frozen custard. They had two specials for the night, a donut sundae and Napa sundae. 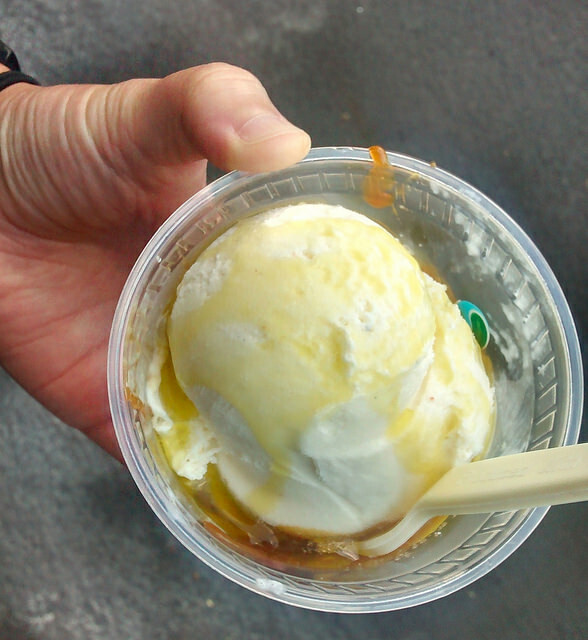 I contemplated getting the Napa sundae, because of the olive oil, and I didn’t like Bi-Rite Creamery’s version. I ended up going for it, and it turned out to be aaaaawesome!! Napa sundae – bottom layer of burnt caramel, scoop of vanilla bean, topped with EVOO (extra virgin olive oil) and Himalayan sea salt. Napa Style Sundae is a single scoop of the classic vanilla bean custard that sits on top of a burnt caramel bottom, topped with olive oil and sea salt. The sweet custard flavor mixed with a salted caramel style topping is the perfect combination of salty and sweet and for $6, is the perfect indulgence. Bi-Rite Creamery’s version (“Sam’s Sundae”) had chocolate ice cream with bergamot olive oil, maldon sea salt, and whipped cream. I think it was the chocolate ice cream (I dislike chocolate) and the type of oil that threw me off. Frozen Kuhsterd’s version had vanilla bean instead of chocolate, burnt caramel, and extra virgin olive oil, which was waaaay better, IMO.